The moment a guy first learns that his partner is pregnant — that he is going to become a father! — is momentous. For some, it sets off a riotous pinball cascade of doubts, fears, pride, excitement. For others, the inner landscape goes utterly silent. You get my point — it’s huge. A mother’s attachment to her baby begins long before birth. By the last trimester many mothers feel like they know their babies, having been enjoying for months their familiar, reassuring movements in the womb. But what about men and pregnancy? 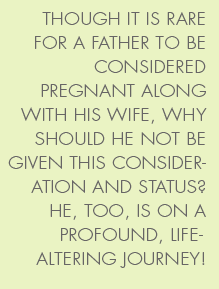 What are a father’s experiences during those wondrous nine months? How does the attachment process begin for them? Is a father’s only option to look on with wonder (and sometimes envy) at the beautiful relationship forming between his once-doting partner and this tiny interloper? A Sober Look at Neonatal Care ~ Foundations of Violence? With barbeque grills across the country barely cooled off from Father’s Day, I’m reflecting on the pre-release screening I attended last week of Janel Mirendah’s film The Other Side of the Glass — a birth film for and about fathers. Its chilling glimpse of hospital neonatal care protocols has important implications for the idea of raising a generation of peacemakers. To read more of this post, please see it at mothering.com. A mother’s attachment to her baby often begins long before birth. By the last trimester many mothers feel like they know their babies, having been enjoying for months their familiar, reassuring movements in the womb.